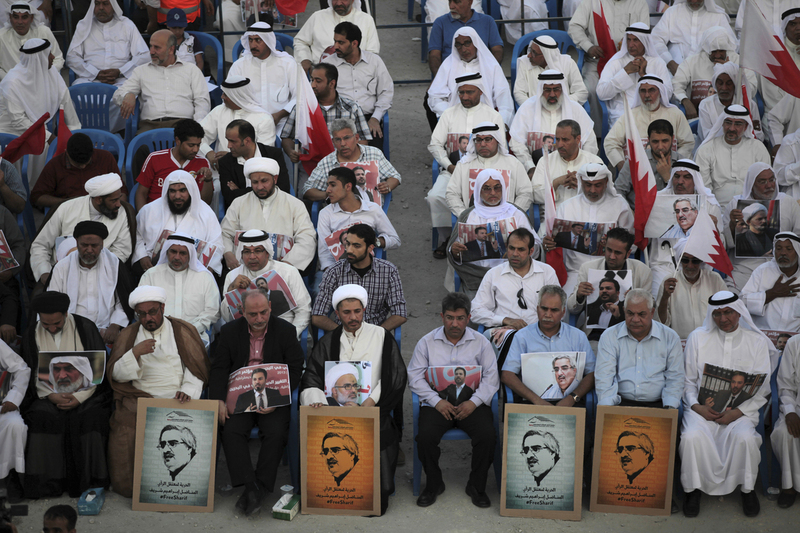 Bahrain Court Orders Dissolution Of Country's Last Major Opposition Group : The Two-Way The court order targets the secular National Democratic Action Society. Human rights groups are decrying the court order, saying it amounts to a de facto ban on all opposition in the country. Waad was one of the opposition groups that participated in a Sept. 2013 demonstration. Before a court ordered it to dissolve today, it was the only major opposition group still operating in the country. A court in Bahrain has ordered the country's last major opposition group to dissolve, amid a wider crackdown on freedom of expression. Wednesday's ruling from the High Civil Court targeted the secular National Democratic Action Society, also known as Waad, and ordered the liquidation of its assets, according to the state media. The ruling is subject to appeal, Reuters reported. Human rights groups are decrying the court order, with Amnesty International describing it as part of a "blatant campaign to end all criticism of the government." The island nation's ruling family is Sunni, and its population is majority Shiite. Like many other countries in the region, it saw major pro-democracy protests in 2011. The government's allies in Saudi Arabia and the UAE sent in troops and tanks, and security forces have detained thousands in the crackdown on dissent. Part of the government's rationale for dissolving Waad stems from a statement the group made in February to mark the sixth anniversary of the start of the 2011 protests. It described "ongoing violations of human rights" and said the "constitutional political crisis continues." Bahrain's Ministry of Justice and Islamic Affairs filed a lawsuit weeks later, saying this "attitude" violated a law that called for "respect for the rule of law." It also took issue with the group's characterization of three men convicted of killing three police officers and then executed, as "martyrs." According to Amnesty International, the group has "repeatedly stated their opposition to violence and commitment to peaceful means and they have denied the charges." There are still two smaller opposition groups operating in the country, according to The Associated Press, but Waad "was seen as the last major opposition group still functioning in Bahrain, which is home to the U.S. Navy's 5th Fleet." Both Sunni and Shiite activists are part of the group. Last year, according to Reuters, the government's crackdown on dissent escalated "when authorities banned the main Shi'ite Muslim opposition group, al-Wefaq, and revoked the citizenship of Ayatollah Isa Qassim, the spiritual leader of Bahrain's Shi'ites, accusing him of fomenting sectarian divisions." Sayed Ahmed Alwadaei, the director of advocacy for the U.K.-based Bahrain Institute for Rights and Democracy, described Wednesday's court order as a "declaration of a de facto ban on all opposition." President Trump met with Bahrain's King Hamad bin Isa al-Khalifa earlier this month, as Reuters reported, where he stressed the countries' "wonderful relationship" and said there "won't be strain" between them under his administration. Last week, a major raid on protesters became "deadliest day since protests began in 2011," according to the Bahrain Institute. Five people were killed, according to news reports, and the Ministry of Interior said it arrested 286 people.